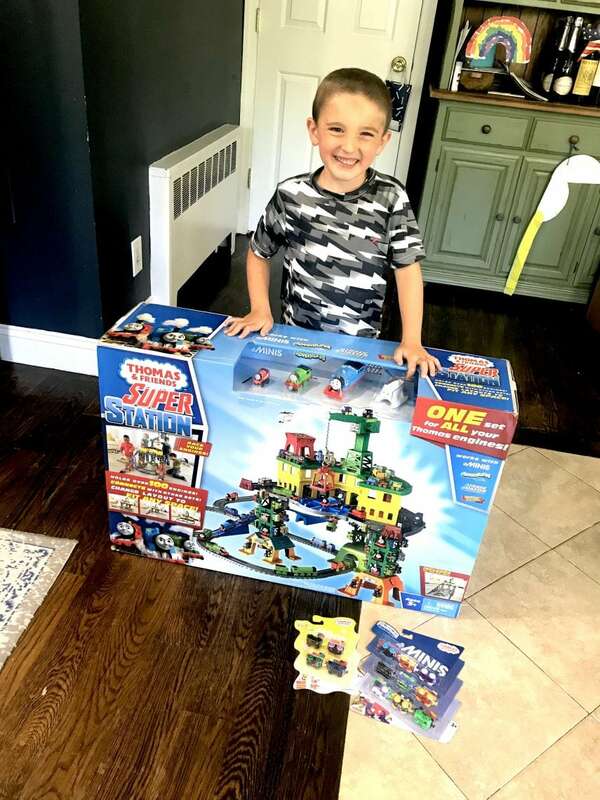 The Thomas and Friends Super Station was so much fun to put together. In fact, it hasn’t left our kitchen yet. The boys use it too frequently to put it in the basement. It’s our new favorite after-school activity. The holidays are right around the corner and if you have little train lovers on your list, you need to consider the Thomas Super Station and soon! I have a feeling this hot toy is going to fly off the shelves the closer we get to Christmas. 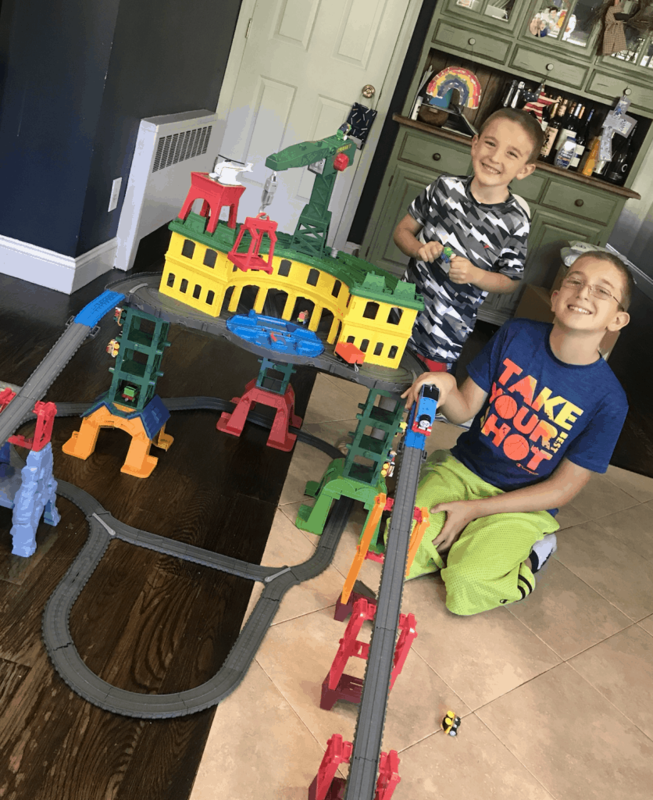 Thomas & Friends Super Station™ is one of the coolest Thomas play experiences ever created making it truly a dream train station! The Super Station™ includes 35 feet of track that make up 10 different locations from the Island of Sodor and work with all scales of Thomas engines. Think about that – any train that you have from the Thomas and Friends family will work with this set. I just love that! We headed to the basement and gathered up all our favorites and now keep a basket next to the tracks so Caleb always has toys to play with. The tracks can also be reconfigured as four different racetracks to fit any play space. To be honest with you, we’ve been letting Caleb really do whatever he wants with the tracks. Sometimes they don’t connect and other times they do. He has so much fun making up new designs. I love this part about the Thomas and Friends Station!! Design and creativity always at work. From MINIs to full-size engines, there is room for over 100 different locomotives—now all your engine friends can play together in one, awesome station! My middle child, Liam, loves to play with his younger brother. It’s nice to hear the worlds they create as I cook dinner. Moms and Dads, I know we always try to keep our houses clean – but I have been receiving so much joy from keeping this piece in the kitchen and near me. I cook dinner and listen to my boys’ imagination. A truly wonderful sound to hear. Check out the Thomas and Friends Super Station here. That is a really neat toy. I know my little guy would have loved that when he was younger. We love Thomas!!! This is such a great set, it’s so big and you can have so much imagination with it. I think Mimi needs to put this on her Xmas list for the boys! What a neat set! I remember buying Thomas toys for my nephew a few years back when he was a wee one. I always thought they were so well crafted and made to withstand rough boy play. I bet the kids had a ball putting this together! Looks so much and interactive for boys (and girls). Now this is an impressive Thomas & Friends set. It’s really cool that it works with so many types of trains and toys! Oh my gosh! This is so amazing! My son would go absolutely crazy for this! I need to buy one of these for Christmas. What a great Thomas set! How fun! I bet a lot of kids will like this! They weren’t kidding about it being a super station, which is awesome! I love that train set! I have two boys who will have so much fun playing with it, without a doubt. And I’m pretty sure they’ll appreciate the size as well. That means more trains to add! Little girls love trains too. My granddaughter would have a blast playing with a Thomas and Friends Super Station. I’m checking this out and may get this for her. Looks like an awesome set! I bet my kids would have loved a set like this when they were younger! Oh wow. What a fantastic toy station! I wish we had that when my sons were still young. They would have loved that! My nephew is a little too old for that too. 🙁 Oh well, I will recommend this toy to my friends at work who have young sons. I am sure this will be an awesome gift for Christmas!